Alexis plays a game called "What's That Going In Your Mouth?" with Jack Stone which is not as dirty as you'd expect until she tries to put a dead crab in his mouth. If there was any possible match before, it's as dead as that crab now. 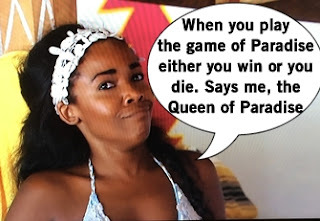 Christen the Virgin arrives in Paradise and makes a romantic assassination attempt on Jasmine the self-dubbed Queen of Paradise: Christen invites Matt on her date. Matt wants to accept the invitation because he hopes to get the most of this experience (making out with several women), so Jasmine passive aggressively gives the OK. Breaking the third wall, Jasmine tells the cameras she's going to give TV and heads to the bedroom to confront Christen who amounts to pretty much nothing but calling Christen "slimy" and the girls nicknaming Christen "Scallop Fingers" due to her to-go dining habits. 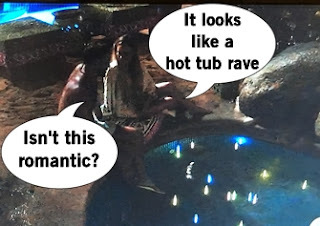 Christen and Matt leave the resort to get chocolate covered bananas, hopefully from a Bluth Company franchise, and buy bathing suits (and kiss in the water). They return from their nice date to find Jasmine ready to pummel him in kisses to stake her territory and everyone secretly laughing at Scallop Fingers eating shrimp. This is actual life and also half of the episode. Robby is still intent on courting Amanda and interrupts a rousing game of Scattegories to surprise her with a hot tub full of glow sticks. 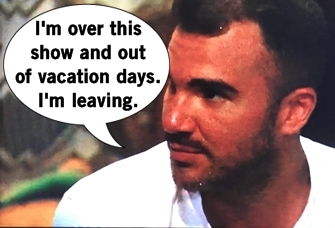 While appreciative of the gesture, Amanda is clearly not super into Robby. The triangles are still in full force and going nowhere. Adam is choosing between Sarah and Raven, while Dean continues to mess with Kristina's head while wanting to pursue Danielle AKA D.Lo. Taylor and Derek are Paradise's supercouple but encounter their first fight over their communication which makes Taylor reconsider their whole relationship. It's Rose Ceremony time and the men hold all the cards (or roses, whatever). But Chris Harrison teases some sort of twist, so freaks for a minute before returning to the moment to acquire a rose. Adam likes how Raven challenges him, but also appreciates how transparent Sarah is with her feelings. Lacey tells Diggy she was upset he didn't consult her before he accepted a date with Dominique, then Lacey gets more upset when he confirms he's not her the rose. Dean tells Kristina how fascinating she is one minute, then minutes later is telling Danielle how he's infatuated by her. Oh and kissing both. C'mon, Dean you're killing us. After showering Amanda with more trinkets from a Mexican gift, Robby gets a kiss from Amanda. Derek apologizes for crossing a boundary with Taylor and they make amends. Matt's completely stressed by the situation of Paradise and a lot of other nonsense that comes with being on this show so he decides he'd like to leave. Jasmine is upset and the end of her summer fling, while Christen has no idea how she'll get a rose. There's only one hope for a rose: Jack Stone. Jasmine and Christen both talk to Jack, but only one goes for the smooch. 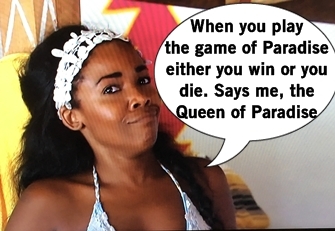 The Queen of Paradise may be dethroned unless she can find a good ally. Will the introduction of Daniel the Canadian be her saving grace?